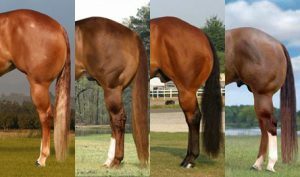 Notice the variation in the hindquarter sections of these showhorses. The angulation in the hindquarter of these horses almost appears like a straight line. This is due to overbreeding. These halter stock horses are unable to bend their legs correctly. The popular Champagne color is highly sought after. Gold is the result of one or two champagne genes acting upon an otherwise red (sorrel or chestnut) horse. This can have several different results, depending upon which other genes are present, but typically creates a golden body color with a flaxen, or near-white, mane and tail. This horse is usually registered as a Palomino, even though the skin is some shade of pink with freckles, not the normal dark skin of the Palomino. The term “mottled”, under skin color, may allow for this in the PHBA registry (Palomino Horse Breeders of America).